Purchased from a estate sale. Looking for some sort of information on her. 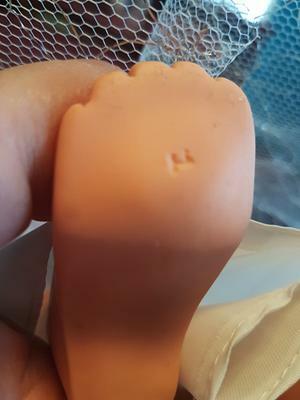 She has HH25 across her mid shoulder, looks like a number 1 on her right foot, blonde hair, blue eyes, soft vinyl full body. No joints, has earrings, necklace, sandles, underware and in great shape. A bit of light blotching on her. Dress isn't torn anywhere. Came in a reliable Doll box. Don't think it belongs to her though. Some numbers on the box though. On the side is 652569 and on the bottom 26A New Teenage. 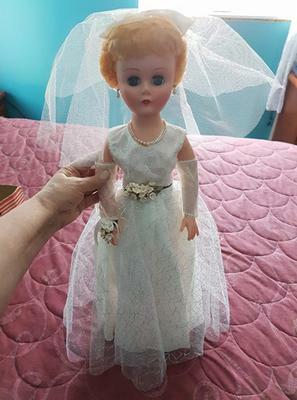 Can anyone help to identify her and from what year and what company made her. Think she might be a Betty Bride from 1950s made by Deluxe Reading Company but not sure as I can't find her any where.